MEVN Stack Tutorial With Example From Scratch is the topic, we will discuss today. We will generate FullStack Single Page Application(SPA) using MongoDB, Express, Vue, and Node.js CRUD Example Tutorial with step by step. For this example, we will not use Vuex for state management because this app will be simple and not complicated. We will create an application where the user can create, update, read, and delete the post. So, let us start the MEVN Stack Tutorial with an example. If you want to learn more about Vue.js then check out this Vue JS 2 – The Complete Guide (incl. Vue Router & Vuex) course. 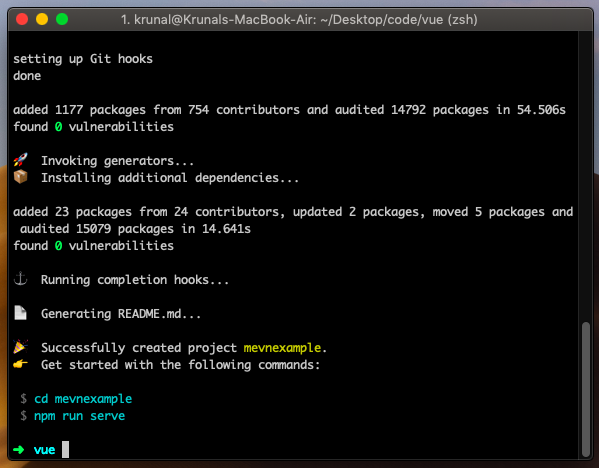 3 #2: Install Vue dependencies. 4 #3: Create the vue components. 8 #7: Create a Node.js backend. 9 #8: Setup and connect MongoDB database. 15 #14: Delete or Remove the data. Type the following command to install Vue CLI, if you have not installed. You can check the version of Vue.js using this command. Type the following command to install Vue.js. Now, go inside the vue project. Open the project inside code editor. I am using Visual Code. Start the vue dev server using the following command. You can see that we have successfully installed the Vue.js. Type the following command to install the axios, vue-router and vue-axios dependencies. The vue-router is used for routing our Vue.js application to use the different components and the vue-axios for sending the network request to the server. Install the Bootstrap CSS Framework version 4 using the following command. Now, import the Bootstrap 4 CSS inside the main.js file. #3: Create the vue components. Go to the src >> components folder and remove the HelloWorld.vue file and create the following components. Now, add the following code inside the HomeComponent.vue file. Next step is to import the HomeComponent.vue file inside the App.vue file. Save the file, and if the server is running, then you can go to the http://localhost:8080 and see that HomeComponent is rendering. Now, create the remaining three components. Inside the main.js file, write the following code. What we have done is that, first, imported the vue-router module and then create an array of routes which has a name, path, and components as the properties. Then we have created the router object and passed the mode history and the routes array. So when the application boot, we will give these routes to the vue application. Now, the next step is to define the <router-view></router-view> element. It renders the component according to the routing path in the Vue application. Save the file and check the following route paths to see if we are getting the exact routes. Write the following code inside the App.vue file. I have added the navbar. So, what we have done is that add the navigation bar and add some animation effect like transition. So when we navigate the routes, the component is changing according to their path. We need to create a form to enter the details of form. So let us create a form inside the CreateComponent.vue file. Also, we have defined the object called post. So here, we have used the two-way data binding. The post object has two properties. 1) title 2) body. We have made one method called addPost(). So, when a user submits the form, we will get the input inside the addPost() method. From then, we will send a POST request to the Laravel server and to save the data into the database. I am skipping the validation of each field because this article is getting long and long. So we will do it in another post. Save the file and go to this URL: http://localhost:8080/create or /create. You can see the form like below. #7: Create a Node.js backend. Create one folder inside the vue project root called api and go inside that folder. Now, initialize the package.json file. 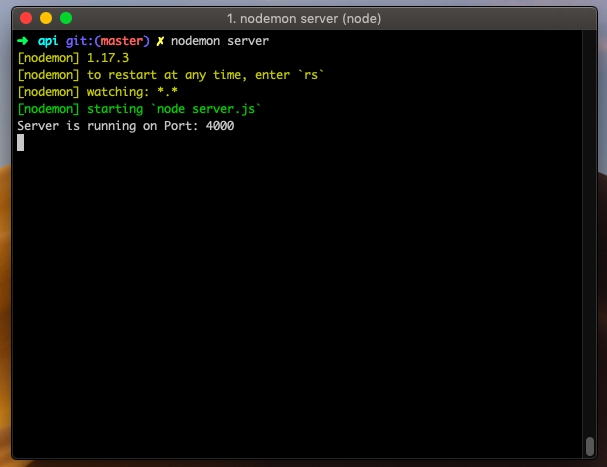 Also, install a nodemon server as a development dependency. So that we do not need to restart every time, we change our server code. We have installed the express web framework which is built on top of the Node.js server. Also, installed the body-parser module to parse the data coming from the request and then installed the cors module which will help us to ignore the cross-site request origin warning from the browser. It is security provided by the browser when we request them from a different server. Now create three files called server.js, DB.js, post.model.js, and post.route.js. All these files are inside the root of the api folder. Write the following code in the server.js file. Now, we need to start a node server using the following command. #8: Setup and connect MongoDB database. If you are the beginner in the MongoDB database, then please check out my below tutorial. I have already installed the MongoDB on Mac. So I am starting the MongoDB server by the following command. You can also use any MongoDB, database client. I am just using the terminal for this demo because it is a simple application. Inside an api folder, create one file called the DB.js which is responsible for connecting our node application to the mongodb database. So add the following line of code. Save the file, and you can see inside the terminal that our node.js application is connected to the mongodb database. Write the following code inside the post.model.js file. We have taken three fields called title and body with String datatype. Write the CRUD operation code inside the post.route.js file. Here, we have defined the CRUD operations in Node.js, which is backend server side. So when the request from the clientside hits the node express server, it maps the URI and according to URI, the above function will be executed, and database operation will be performed and send the response to the client, and in our case, it is vue.js frontend. 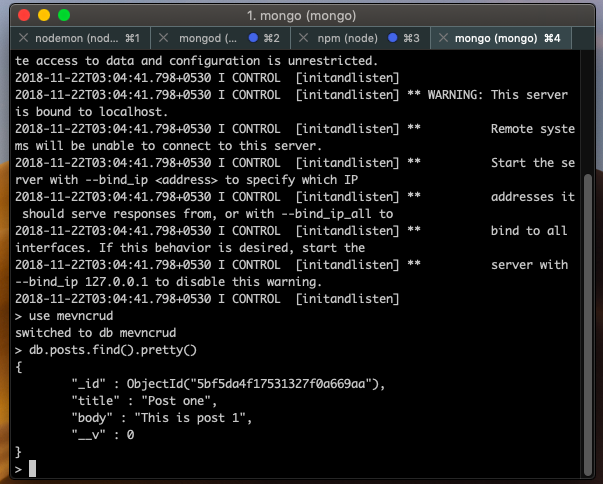 Here, we have used a Mongoose ORM to create, read, update, delete the data from the mongodb database. Mongoose is an ORM(Object Relational Mapping) used in the MongoDB database. Now, we have all the CRUD operations set up on the post.route.js file; we need to import inside the server.js file. So, our final server.js file looks like this. If the linter is showing error on console statement inside the Visual Studio Code editor or other editors, then ignore it because it is a warning provided by eslint configuration. It is not an actual error and you can able to see the output inside the browser. Go to the frontend vue project and import the axios and vue-axios inside the main.js file. Now, we have created the backend. Next step is to send the POST request to the node.js api server. Remember, now we have now three servers are running. Remember, all are running fine otherwise the project won’t work. Write the following code inside the CreateComponent.vue file’s addPost() function. You can now create the post and see in the mongodb database. To check from the terminal, you need to open the mongoshell using the following command. Write the following code inside the IndexComponent.js file. When the component is created, it will send a GET request to the node.js server and fetch the data from the database and then assign that data to the posts array, and then we loop through that array and display the data in the tabular format. Now, when our edit component loads, we need to fetch the data from the server to display the existing data. Then, after changing the data in the textbox and textarea, we hit the update button, and we call the updatePost() function to send a post request to the server to update the data. You will see the edit data from the database and also you can update the database. So till now, insert, read, and update operations are complete. Now, last, the delete is remaining. #14: Delete or Remove the data. Now, the only remaining thing is to delete or remove the data from the database. So, let us write the final code inside the IndexComponent.vue file. Save the file, and now, you can also delete the values from the MongoDB database. So, finally, our MEVN Stack Tutorial With Example Demo is over. I have put this code on Github. So check that out as well. Now, start the mongodb server. Go to the http://localhost:8080 and your project is running. This is a bug. This code deletes from the end of the list until a refresh occurs.